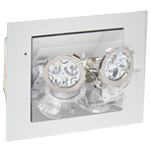 Ideal for architectural applications, the Revelation remote emergency lighting fixture is virtually invisible. In normal conditions (stand-by) the Revelation is concealed in the wall or ceiling. In case of power failure, the door of the unit rotates open 180° and exposes the emergency light. Once main power returns or at the end of the discharge period, the light turns off and the door rotates closed automatically. Provides a choice of high-performance LED lamps.